Lauchlin and Mary Ann Pierce McKinnon came to Berrien County from Telfair County, Georgia, in 1868. Lauchlin McKinnon had signed his oath of allegiance to the United States earlier that year. Lauchlin McKinnon was the son of Charles and Margaret McMillan McKinnon, formerly of North Carolina. Charles McKinnon was a surveyor and laid out the town of Jacksonville, Georgia, the first county seat of Telfair County; he was also one of the first County Commissioners; he and his family lived along the Ocmulgee River, at China Hill. Charles McKinnon and his wife, Margaret McMillan McKinnon are buried in the Old McKinnon Cemetery at China Hill. When Lauchlin and Mary Ann Pierce McKinnon migrated to Berrien County, they brought with them children, Ella P., Reddick Charles, and Laura. Lauchlin and Mary Ann Pierce, and their children are buried in the City Cemetery of Nashville. Some of the graves may have been covered when the street was paved. Mary Ann Pierce was the daughter of Reddick and Rebecca Arthur Pierce, of South Carolina, later of Bibb County, Georgia. She was among the first members of the Methodist Church in Nashville. She was born 14 February 1814 and died 26 May 1898. Her son, Reddick Charles McKinnon, was 15 when they migrated to Berrien County, and was listed as assisting in the building of the first Methodist Church in Nashville. circa 1870. Reddick Charles McKinnon was the grandson of Reddick Pierce, a Methodist Preacher, and his uncle, Lovick Pierce, was a Methodist Bishop. He married Carrie Ann Jane Goodman, daughter of Berrien County's first school commissioner, James Franklin Goodman. 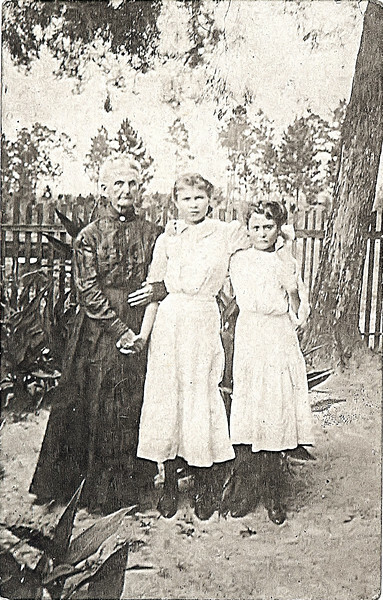 Sarah "Aunt Sadie" McKinnon McRae, wife of William McRae, and daughter of Lauchlin and Mary Ann (Pierce) McKinnon; Bell Turner Taylor, and unknown girl, circa early 1900's.